To see photos, ratings, more things to do, and other tourist information, read our Santa Fe online trip itinerary builder . Manchester, UK to Santa Fe is an approximately 15.5-hour flight. You can also do a combination of train and flight; or do a combination of flight and shuttle. The time zone difference when traveling from Manchester to Santa Fe is minus 7 hours. Traveling from Manchester in August, expect nights in Santa Fe to be about the same, around 16°C, while days are a bit warmer, around 34°C. Wrap up your sightseeing on the 29th (Thu) to allow time to travel to Key West. Kick off your visit on the 30th (Fri): cruise along The Overseas Highway, contemplate the long history of Truman Little White House, then brush up on your military savvy at U.S. Coast Guard Cutter Ingham Maritime Museum, and finally admire the majestic nature at Fort Zachary Taylor. Here are some ideas for day two: see the interesting displays at Mel Fisher Maritime Heritage Museum, explore the galleries of Key West Lighthouse and Keeper's Quarters Museum, and then cast your line with a fishing tour. For ratings, where to stay, and more tourist information, use the Key West travel planning website . Getting from Santa Fe to Key West by flight takes about 8 hours. Other options: do a combination of shuttle and flight; or drive. 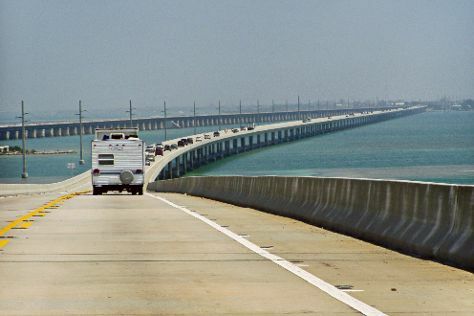 You'll lose 2 hours traveling from Santa Fe to Key West due to the time zone difference. When traveling from Santa Fe in August, plan for somewhat warmer days and much warmer nights in Key West: temperatures range from 38°C by day to 32°C at night. Finish your sightseeing early on the 31st (Sat) to allow enough time to travel to New York City. Your cultural itinerary includes sights like The Metropolitan Museum of Art and Times Square. There's still lots to do: go for a walk through Central Park, pause for some serene contemplation at St. Patrick's Cathedral, pause for some photo ops at Statue of Liberty National Monument, and enjoy breathtaking views from Empire State Building. To find traveler tips, reviews, other places to visit, and tourist information, read our New York City road trip planner . Do a combination of flight and bus from Key West to New York City in 6 hours. Alternatively, you can fly; or drive. Traveling from Key West in September, things will get slightly colder in New York City: highs are around 31°C and lows about 22°C. Finish your sightseeing early on the 3rd (Tue) to allow enough time to drive to Newport. Kick off your visit on the 4th (Wed): examine the collection at The Breakers, then steep yourself in history at Rough Point, then contemplate the long history of Marble House, and finally cruise along Ocean Drive Historic District. On your second day here, take in the spiritual surroundings of Touro Synagogue, admire the striking features of The Elms, then see the interesting displays at International Tennis Hall of Fame, and finally appreciate the extensive heritage of Cliff Walk. To find more things to do, maps, reviews, and tourist information, read our Newport trip maker app . You can drive from New York City to Newport in 4 hours. Alternatively, you can do a combination of bus and flight; or take a bus. Plan for little chillier temperatures traveling from New York City in September, with highs in Newport at 27°C and lows at 17°C. Wrap up your sightseeing on the 5th (Thu) early enough to drive to Bar Harbor. Bar Harbor is a town on Mount Desert Island in Hancock County, Maine, United States. You'll explore the less-touristy side of things at Mount Desert Island and Shore Path. Your cultural itinerary includes sights like The Seal Cove Auto Museum and St. Saviour's Church :. Spend the 9th (Mon) exploring nature at Acadia National Park. There's much more to do: take your sightseeing to a higher altitude at Cadillac Mountain, cruise along Park Loop Road, don't miss a visit to Land Bridge to Bar Island, and admire the natural beauty at Asticou Terraces / Thuya Garden. To see where to stay, traveler tips, photos, and tourist information, go to the Bar Harbor online sightseeing planner . You can drive from Newport to Bar Harbor in 7 hours. Other options are to take a bus; or do a combination of bus, flight, and car. Expect a bit cooler evenings in Bar Harbor when traveling from Newport in September, with lows around 13°C. Finish up your sightseeing early on the 9th (Mon) so you can travel back home.